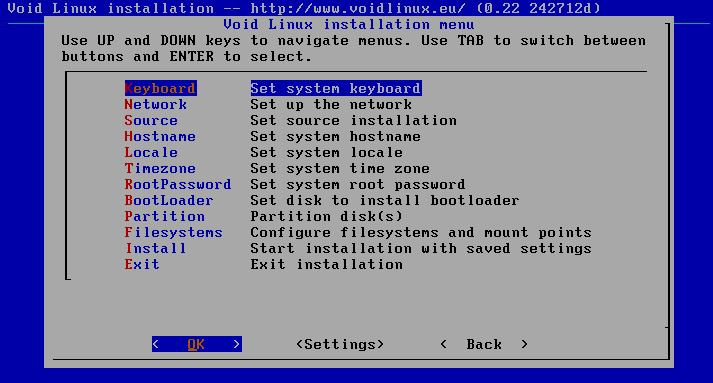 Void is a general purpose operating system, based on the monolithic Linux kernel. Its package system allows you to quickly install, update and remove software; software is provided in binary packages or can be built directly from sources with the help of the XBPS source packages collection. Void Linux is an independent distribution, developed entirely by volunteers and adheres to a rolling release model. Got five minutes to install Void? Void uses a simple and straight forward text based installer to guide you trough the traditional installation steps. Apart from partitioning your disk, the installation is probably easier, and a lot quicker than most graphical installers. My only issue with the installer was lack of support for the latest wireless encryption standards. It only supports wep and wpa, which forced me to hunt down a network cable. The first order of business was updating the system and getting connected to my wireless network. As NetworkManager was available in the repository that part worked itself out nicely. Next on the agenda was creating a default user account, installing Xorg and finding a suitable desktop environment. It sounds like it could take some effort but with Void it’s really a matter of a few xbps-install commands. However, I strongly recommend checking out the documentation available on the Void wiki as it will set you up with a working system in no time. Speaking of desktop environments, since KDE is my preferred desktop environment I decided to check out Void’s KDE meta-package. Unfortunately KDE 4.14.3 it’s neither current or bleeding edge, but I’ll take it. Meet the X Binary Package System (xbps). Xbps was designed and implemented from scratch. Its goal is to be fast, easy to use, bug-free, featureful and portable. When I first read about Void Linux I got the impression that xbps was the main project and that the Void distribution was actually thrown on top to be presented as a proof of concept. I guess that is an exaggeration but obviously xbps is an essential building block. In addition, all packages are built with xbps-src and the source templates are hosted on Github. 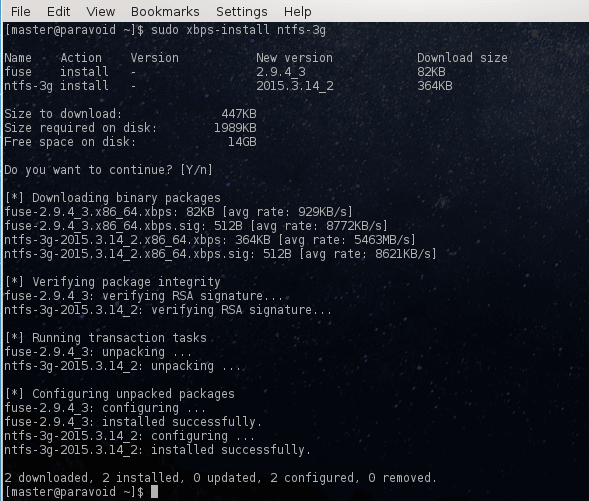 I’ve had no issues to report with package management on Void, it’s fast and flexible as advertised. The concept of xbps-src takes a bit of getting used to, but once you get past the technical jargon the template files are actually pretty easy to work with. With the base install, Void can be turned into whatever you wish to assemble. In my case, I wanted a KDE based desktop environment for my Asus laptop. 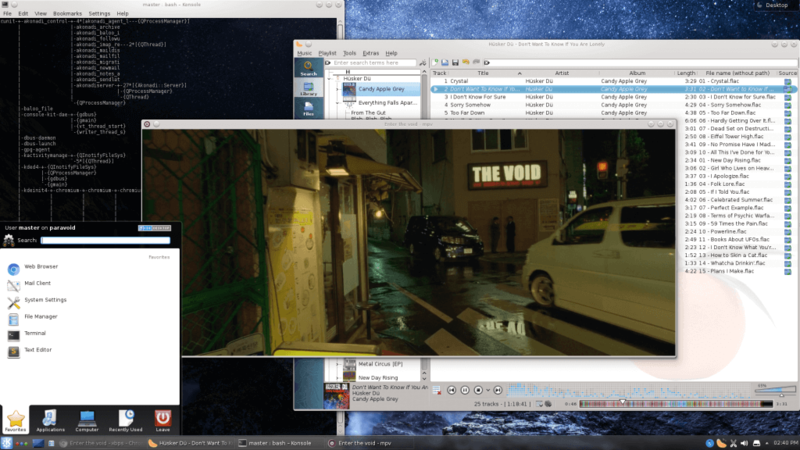 Void’s default KDE installation is rather raw and bare bones compared to what you get in other distributions. Most notably was the complete lack of multimedia applications. Not even a decent image viewer was included (Okular doesn’t count). 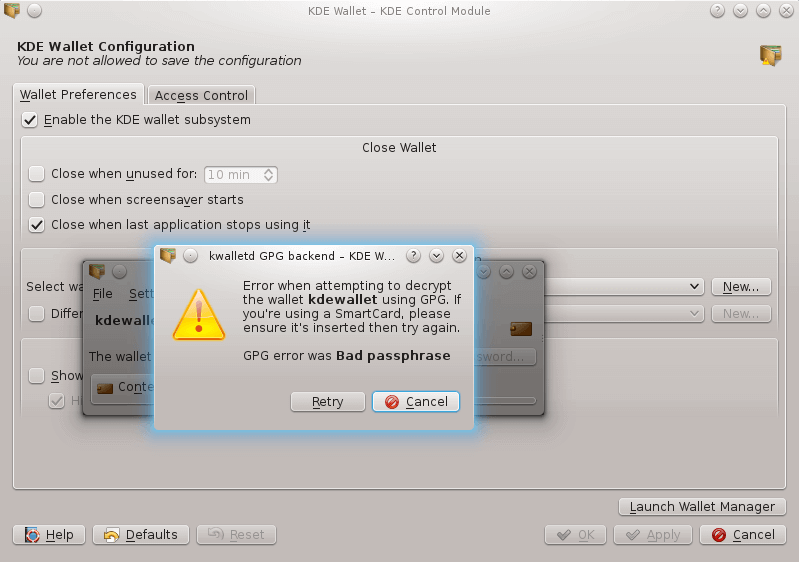 I also had a few issues with the KDE Wallet using a GPG backend. In short, it does not work of out of the box as it has no means receiving the passphrase to do the actual decrypting. It’s necessary to configure the gpg-agent and install pinentry before it works as expected. Further, I also had to install some additional Cyrus SASL libraries for KMail to be able to establish a connection with an IMAP server over SSL. Since Void is a hands-on type of distro this isn’t necessarily a big deal, but new users should be aware that manual configuration and not graphical wizards are how things get done. Anyhow, after a few minor fixes I had the desktop I wanted without any further obstacles. Void is one of the few distributions to use runit as its init system and service supervisor. I’m very pleased with the performance and simplicity it brings compared to another service manager I could think of…. In addition to Runit, Void also ships Eudev and ConsoleKit2 which makes it a great alternative to the mainstream distributions that are following the blueprints laid by Red Hat. There is one particular feature that sets Void apart from other distributions I’ve used, and that is its speed and responsiveness. It’s faster than anything else I’ve ever put on this laptop, and I’m not talking benchmarks here but improvements that are obvious to the naked eye. Everything from the boot process to starting applications is lightening quick. To put that in context, this particular laptop is performing better running Void than it ever did with Arch Linux. Void is also unusually light on system resources, so I’m considering slapping it on my backup RPi2 to see what kind of performance I could get from it. Check, but you need to activate the non-free repository as Void consists only of free software. No theming as far as I can tell (at least with KDE). Void also seems to pretty much stick with vanilla upstream sources. Void does have a distinct resemblance to Arch Linux (which is not a bad thing) both in terms of its package manager, build system and overall feel, but it’s an independent distribution (as in not a fork). Void Linux is an exciting distribution that I have no hesitation in recommending. It’s also worth noting that Void provides live images containing different desktop environments if a base install is not your thing. On that note, I tried the Mate edition in a VirtualBox session, which installed fine, but I had to reboot into recovery mode to add my user account. It probably has a way to drop to shell from the login manager, but I didn’t spend any time on it. Anyhow, as I’ve only used Void for a couple of weeks, I can’t really vouch for its long term stability (it’s a rolling distro after all) but the developers seem to have the technical chops to give it a good run. Personally, I’ll definitively keep it on my inventory list for 2016. At the end of last year, I decided to install an interesting looking operating system named GuixSD. This was to be my first experience of running a system consisting entirely of free software. Unfortunately, the absence of non-free firmware also meant that I in 2018 would be giving up on wireless internet. I've never owned a single Apple product but lately I've been wondering how good a real UNIX certified operating system might actually be. To get my feet wet, I decided to try out macOS Sierra in a VirtualBox session on a Linux host. I'm aware that much of the Apple experience is closely connected to the hardware, but personally I was more interested in the isolated OS experience. When you’ve been running GNU/Linux distributions for an adequate number of years, I do believe you'll eventually find yourself walking the path to Mount Gentoo in hope of joining the ancient Greybeards. Many have met their demise on the road ahead, but armed with the Gentoo handbook we're confident that it's within our reach.